Latest upgrades to War Trophies Listing! In preparation for my presentation at the 2015 Canadian Military History Colloquium, at the Laurier Centre for Military Strategic and Disarmament Studies, Wilfred Laurier University, I have released an upgraded listing of War Trophies. The table has gone beyond its original source, the War Trophies Commission’s shipping ledger, to include details from War Diaries of CEF units, notations about surviving artifacts, condition reports, and in some cases provenance and historical details about relics that did not survive the Second World War scrapping drives. 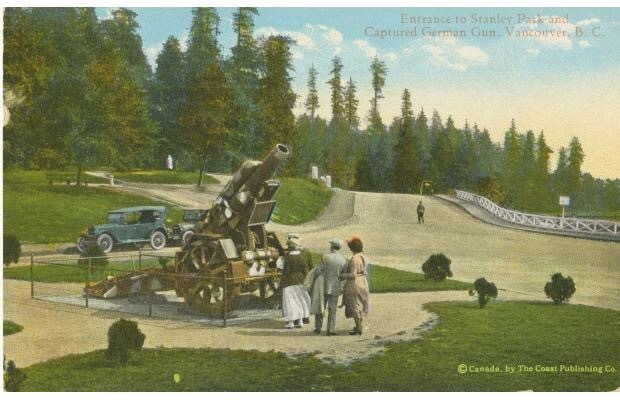 21cm howitzer, Stanley Park entrance, Vancouver. It was captured by the 72nd Battalion on November 3rd, 1918, in the town square at Valenciennes, during the pursuit to Mons. In the years leading up to 1939, there was a concerted effort to save it. However, it was scrapped during the Second World War. Once again, the table now also includes Newfoundland trophies. Significant projects for 2015 will include cypher encryption, an aerial photography interpretation section, sound locating, Forward Observation Officers, the construction of a larger Zeppelin shed, and smarter uniforms for all members.